Every so often I get questions from people who want to know how they can improve their grammar. 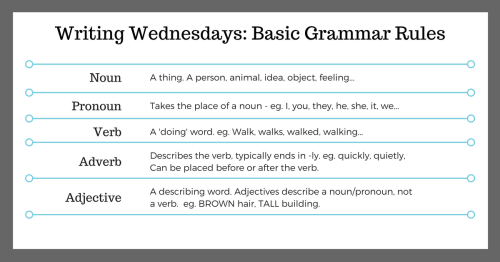 And while I may not be completely qualified to help on this one, and I am not an English teacher, I’m going to do my best to give those of you who struggle with grammar some advice. And I know what you’re going to say. But Beth, didn’t you just write a post last week that ended with you saying there are no hard-and-fast rules when it comes to writing? I did, you’re right, but I did state things like grammar and spelling as some of the exceptions - the kind of things that make your story readable, easy to read. 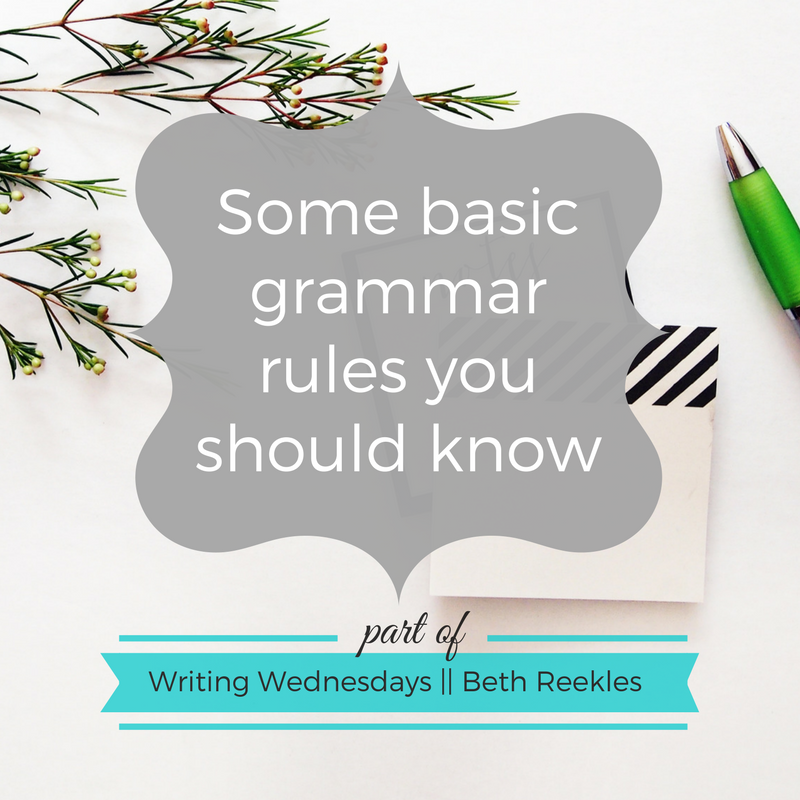 You might also like this post I wrote a couple of years back for some more general advice on grammar and spelling. The biggest thing I’m going to say? The more you read, the more you’re going to pick up nuances and general grammar rules. You might also like this post on why you need to read if you want to be a writer. Another big thing I want to recommend is that if you’re not sure, Google it. Check it out online. Especially when it’s something common, like there/their/they’re. Similarly, two words may be spelled the same but mean different things, so a spellchecker won’t pick them up. Like compliment/complement, practice/practise. If you’re ever unsure, in any doubt at all, Google. You might also like this post for advice on using first and third person in your writing. Contractions, I guess, fall under grammar. If you can split the word into two, use the apostrophe. So ‘its’ is used when you’re talking about something belonging to the it, eg. The building was grey, its doors black. You can’t split the ‘its’ to ‘it is’ in this case, otherwise the sentence would read, The building was grey, it is doors black. Which doesn’t make sense. Another example: You’re an idiot. This can be split to read, You are an idiot, which makes sense. If you used ‘your’ instead, you’d be talking about the idiot belonging to you, which doesn’t make sense. I hope that makes sense? That’s literally the best way I have of explaining which way around those things are supposed to be. Misuse of contractions (as well as the to/too, they’re/their thing) is one of my biggest pet peeves when I’m reading, and can really turn me, personally, off a story). 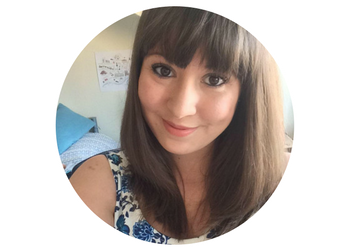 You might also like this post to find out my top ten tips for new writers. Then we get into the more complicated stuff, like sentences and clauses and subjects. A sentence should be a complete thought. Like that one, just then. For instance that. (See, that one just then wasn’t much of a sentence. If your character said that but got cut off, you should indicate that with a hyphen or ellipsis (three dots) rather than a full-stop.) The subject is basically what your sentence is about – a person, a noun, whatever. And not that you necessarily need to know what an adjective or a pronoun is to write them (you’re probably already doing it) but in case you were wondering, here’s an infographic. So, I think that’s pretty much it for my advice on basic grammar rules? Right now, I can’t think of anything major that I’ve missed, but if I have, please let me know and I’ll update the post. Hopefully there’s enough here to help you out if you’re super unsure on your grammar!